Gustave is a large male Nile crocodile from Burundi. He is notorious for being a man-eater, and is rumored to have killed as many as 300 people from the banks of the Ruzizi River and the northern shores of Lake Tanganyika. Though the actual number is difficult to verify, he has obtained near-mythical status and is greatly feared by people in the region. Gustave was named by Patrice Faye, a herpetologist who has been studying and investigating him since the late 1990s. Much of what is known about Gustave stems from the film Capturing the Killer Croc, which aired in 2004 on PBS. The film documents a capture attempt and study on Gustave. Since Gustave has not been captured, his exact length and weight is unknown, but in 2002 it was stated that he could be "easily more than 18 feet (5.5 m)" long, and weigh more than 2,000 pounds (910 kg). He was estimated to be around 100 years old in order to achieve such outstanding size; however, further more careful observation of Gustave revealed a complete set of teeth when he opened his mouth. Since a 100-year-old crocodile "should be nearly toothless" (according to the documentary), he was estimated to be "probably no older than 60, and likely, still growing". Gustave is also known for the three bullet scars on his body. His right shoulder blade was also found to be deeply wounded. Circumstances surrounding the four scars are unknown. Scientists and herpetologists who have studied Gustave claim that his uncommon size and weight impede his ability to hunt the species' usual, agile prey such as fish, antelope and zebra, forcing him to attack larger animals such as hippopotamus, large wildebeest and, to some extent, humans. According to a popular local warning, he is said to hunt and leave his victims' corpses uneaten. The documentary film also stated that since crocodiles can go several months without eating, Gustave could afford to select his prey carefully. 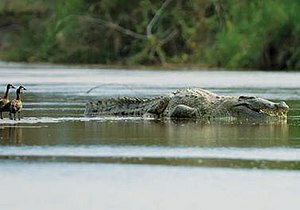 In 2009 the croc had reappeared in Ruzizi River near Lake Tanganyika. In Capturing the Killer Croc, Patrice Faye and other scientists attempted to capture Gustave. According to the film, Patrice performed two years of investigations before the attempt. Patrice and his team were given a 2-month time slot for their capture attempt; thereafter a change of government would risk plunging the country into civil war. First, a trap cage weighing a tonne and nearly 9 meters (30 feet) in length was developed. The team then located Gustave and installed and baited the trap, placing a hidden infrared camera inside as well. Several kinds of bait were used, yet none of them attracted Gustave or any other creature. The scientists then installed three giant snares on strategic banks to increase their chances of capture; although smaller crocodiles were caught by the traps, Gustave was not. In the last week before being forced to leave the country, the team placed a live goat in the cage. Nothing happened until one night, the camera failed due to stormy weather. The next morning, the cage was found partially submerged and the goat had disappeared. The team speculated that the rising waters helped the goat to escape, or that the cage had failed, but due to the absence of a camera recording, no conclusion could be drawn. The last reported sighting of Gustave was in June 2015. A resident claimed that Gustave dragged an adult bull buffalo on a riverbank. Gustave is the basis of the film Primeval (originally titled Gustave). Lolong, was the largest crocodile in captivity until his death on February 10, 2013. ^ a b c "PBS Previews Newsletter: Capturing the Killer Croc". PBS. May 12, 2004. Archived from the original on 2004-08-30. ^ Michael McRae (February 2008). "Gustave, the Killer Crocodile – Update". National Geographic Adventure Magazine. Archived from the original on 2008-08-05. Retrieved 2010-07-27. ^ Mary Anne Potts (2009-03-19). "Serial Killer Croc Gustave Spotted in Burundi". National Geographic Adventure Magazine. Retrieved 2018-11-17. ^ Trace Thurman (2006-06-14). "Gustave – Primeval". Bloody Disgusting. Retrieved 2018-11-17. This page was last edited on 1 April 2019, at 04:46 (UTC).